Summary: The little red chicken and her father are back with their bedtime story routine. 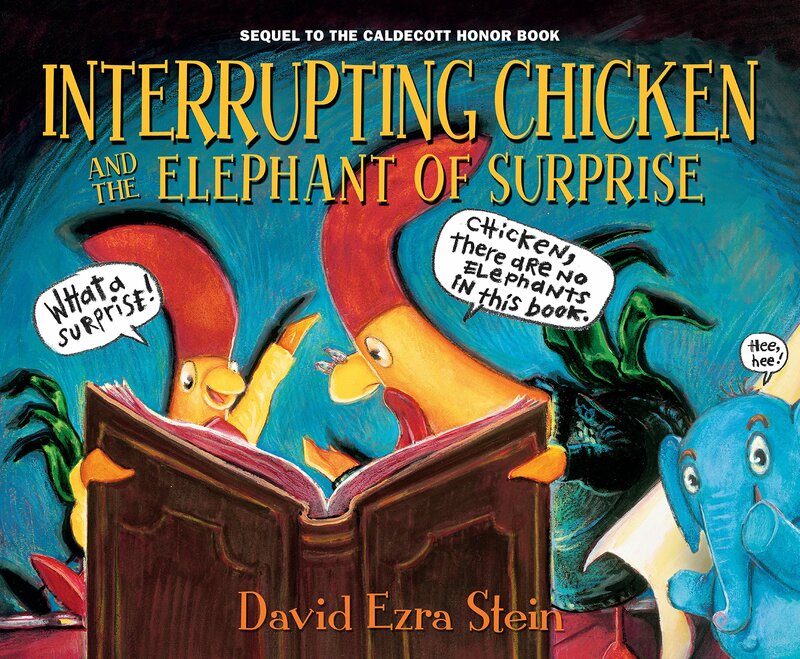 This time, Little Chicken has been told by her teacher that every story has an element of surprise….only she heard this as an elephant of surprise. So in each story her father reads to her, she is on the lookout for that elephant. Just like in Interrupting Chicken, the father reads a classic fairy tale, and his daughter interrupts, inserting herself and the elephant. The illustrations for the stories are a bit more dignified, with paler colors and classic-looking characters; the elephant and Little Chicken herself appear in the stories in the style of the rest of the book. Dad is still awake at the end of this story; on the last page, Little Chicken asks him for help with her math homework. 40 pages; ages 4-8. Pros: Fans of the first Caldecott-honored Interrupting Chicken will no doubt enjoy some chuckles as they revisit Little Chicken and her patient, loving father. Cons: The premise of the interrupting chicken felt a little tired to me in this one. A copy of this book was provided to me by Candlewick.